German style Brötchens. If you are like me I don’t like that soft bread what is sticking to the roof of your mouth, then you may want to try this recipe of Brötchens which I got from the cookbook Healthy bread in 5 minutes a day. 1. Add to the measuring cup three egg whites, 3 cups of like warm water, 1 1/2 tbsp yeast, 1 1/2 tbsp salt and the the 6 1/2 cups flour. 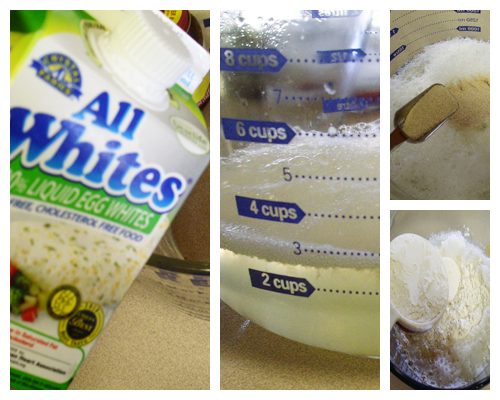 2.Mix with a spoon in a bowl, I have a special bowl just for this. I made a small hole in the top. Now you mixed it all up let it rise at room temperature for 2 to 5 hours, then you can put it into the fridge save the dough for about 5 days if you still have some left, freeze the remainder. 3. Put the cornmeal on the baking stone or cookie sheet. 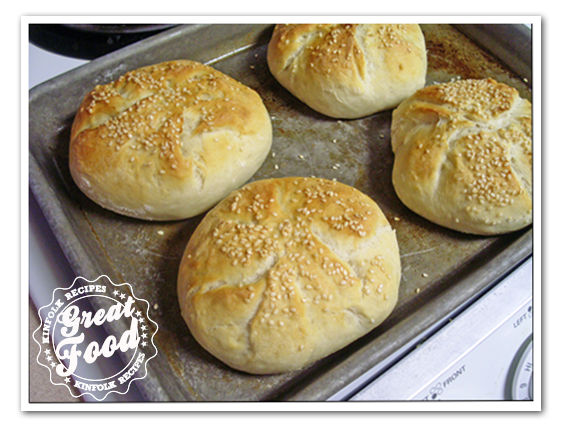 Spread out some flour on the kitchen counter and get ready to make your brötchens. 4. Preheat the oven to 450F. Put a baking dish with hot water in the bottom of your oven. The baking stone should be above the baking dish. 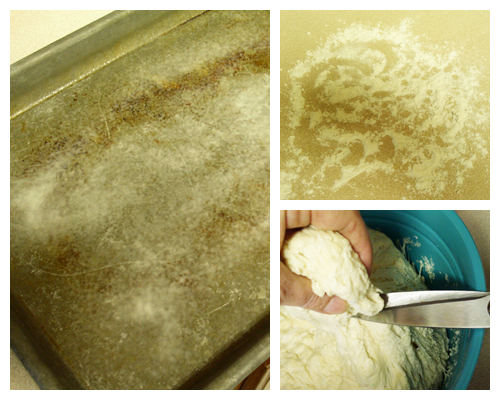 The steam will produce that hard crust. 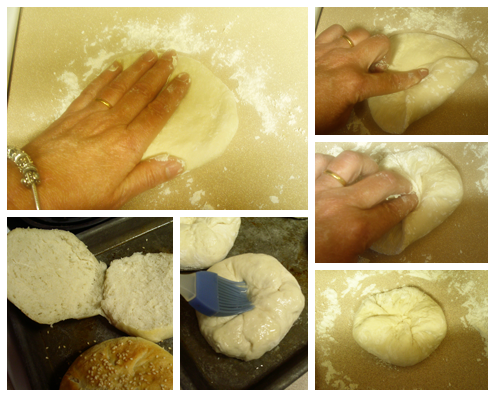 Tear off a chunk of dough and shape the brötchens the way you see on the pictures below. Let the brötchens rest for about 60 minutes. Then use a pastry brush to cover the brötchens with egg white. If you want to add seeds or salt to the crust do so now. Bake for for 25 min in the preheated oven 450F. Make sure there is plenty of hot water in the baking dish. Serves: One full recipe makes 17 3-ounce rolls. 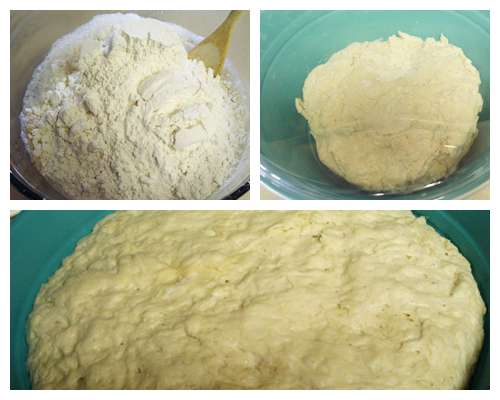 Add to the measuring cup three egg whites, 3 cups of like warm water, 1½ tbsp yeast, 1½ tbsp salt and the the 6½ cups flour. Mix with a spoon in a bowl, I have a special bowl just for this. I made a small hole in the top. Now you mixed it all up let it rise at room temperature for 2 to 5 hours, then you can put it into the fridge save the dough for about 5 days if you still have some left, freeze the remainder. Put the cornmeal on the baking stone or cookie sheet. Spread out some flour on the kitchen counter and get ready to make your brötchens. Preheat the oven to 450F. Put a baking dish with hot water in the bottom of your oven. The baking stone should be above the baking dish. The steam will produce that hard crust. 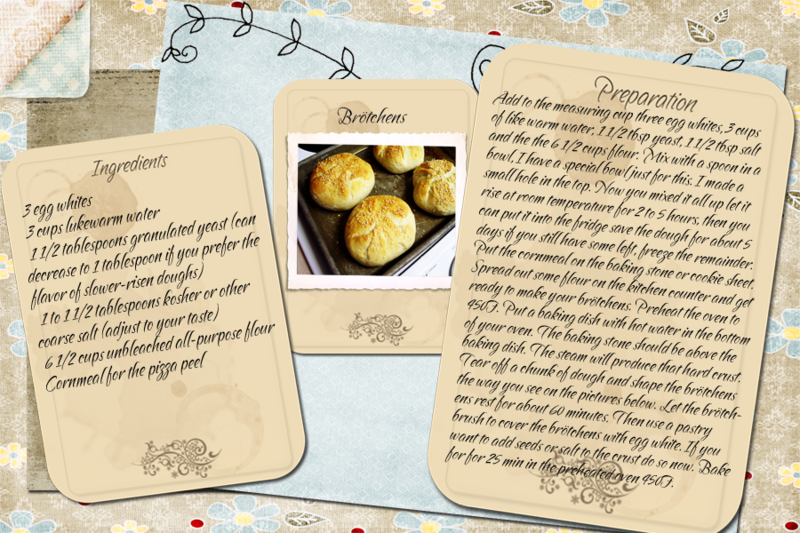 Tear off a chunk of dough and shape the brötchens the way you see on the pictures below. Let the brötchens rest for about 60 minutes. Then use a pastry brush to cover the brötchens with egg white. If you want to add seeds or salt to the crust do so now. Bake for for 25 min in the preheated oven 450F. Make sure there is plenty of hot water in the baking dish.